What is the purpose of the Platform Hand Truck? The Platform Hand Truck is used to move supplies and materials from one location to another. There are several designs available and the weight limits vary by model, from 700kg to 1250kg. 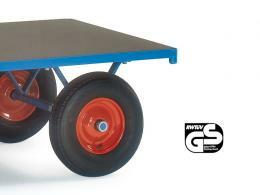 Construction of this heavy duty trolley is composed of fully welded steel and an anti-slip plywood platform. The height of the platform is available in 2 different sizes, 420mm and 490mm. There is an option for 2 different types of tyres, rubber or pneumatic. 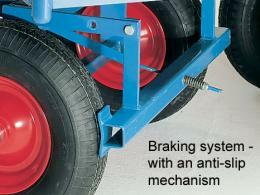 An added feature is the anti-slip braking system. 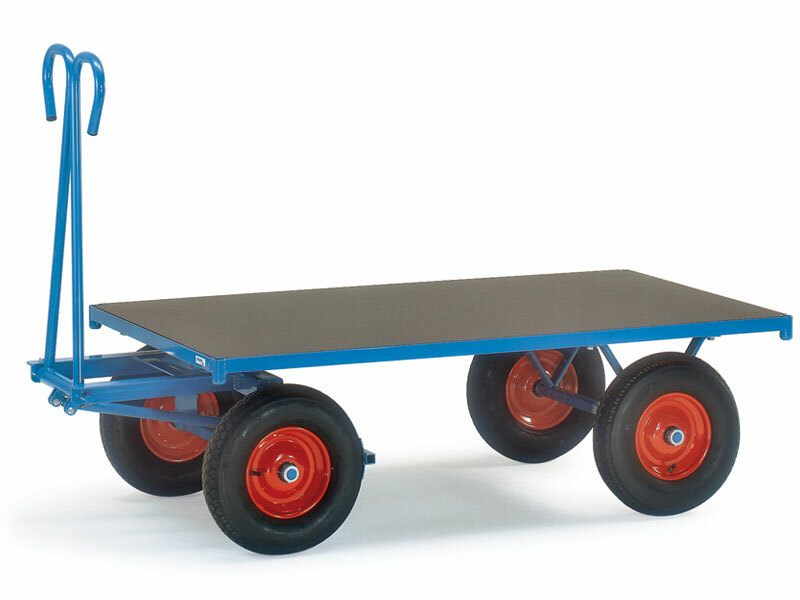 This flatbed trolley is available in blue powder finished coat and has red rims for the wheels. The overall height of the hand trolley range from 1125mm to 1200mm, the width ranges from 800mm to 1000mm. There is a handle that has safety loops and a drop safety device. Where can the Platform Hand Trolley be used? This platform trolley can be used at construction sites, warehouses, sorting facilities, and for landscaping projects. 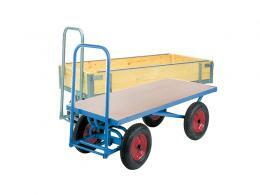 Having this industrial trolley will allow materials and packages to be moved with ease. The tyres can move through any terrain and the high platform can move over obstacles with no problem. Packages can be loaded for easy transfers to vans or trucks for delivery, making it an ideal site trolley. Who might use the Platform Hand Trolley? Construction workers can use the hand truck to move materials to a central location for daily tasks and projects. Warehouse personnel can utilise the pull along trolley for packages and supplies for shipments. Landscapers can haul soil, plants, and trees for yard and garden projects. The platform truck is manufactured by using the best materials. The unit is sturdy and highly durable under normal conditions.